The leading cause of unintentional injuries treated in emergency department visits throughout U.S. hospitals is falling. Every year, roughly 10 million Americans seek emergency medical care after falling, according to the Centers for Disease Control and Prevention (CDC). But what do these injuries entail? 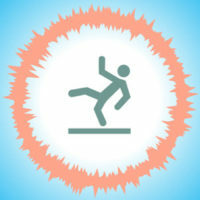 Below are some of the most common types of severe injuries associated with taking a bad fall. While most premises falls end up being nothing more than a moment of embarrassment and a bruised or skinned knee, some result in severe injury, permanent disability, and even death. Torn Anterior Cruciate Ligament (ACL Tendon). The ACL tendon enables knee movement, and without it, walking is impossible. A torn ACL takes a healthy adolescent or young adult at least six months to regain the majority of their previous strength and mobility. Complete and full strength after surgery is virtually never attained, even if the injury occurred at a young age. This means that for older people, a torn ACL will noticeably be with them for the rest of their lives, possibly cutting into their normal activities and decreasing their value of life. The older we get, the weaker our bones become. While it is quite possible for a young person to fracture a hip during a bad fall, it becomes more and more of a risk factor the older the fall victim is. A fractured hip, for a person over the age of 60, becomes increasingly dangerous, as it actually becomes a threat to their very life. The older the fall victim, the less chance they have of recovering. Even for young to middle aged fall victims, a broken hip represents a serious injury in terms of surgical cost, time off work, and loss of mobility and strength in their future years. Serious slip and fall accidents have a very high chance of affecting a person’s back, even if the back was not the main body part that was injured. Back injuries range from complete to partial paralysis if the spinal cord was damaged, to spinal column damage, to severe soft tissue injury. Chronic back pain is common among Americans, and, in fact, over three percent of all emergency department visits are for low back pain alone, according to research published in the National Library of Medicine. Falls are partially to blame for many people’s chronic back pain, and even if you only sustained soft tissue damage, consulting with an attorney is crucial in ensuring your physical recovery. If you hit your head during your recent slip and fall, chances are that you may have suffered a Traumatic brain injury (TBI). TBIs, like any other injury, have varying levels of severity, with the most severe resulting in death or permanent brain damage and the least severe being a headache, dizziness, nausea, vomiting, and forgetfulness. If you suffered any type of injury during a slip and fall in or around West Palm Beach, do not hesitate to call the Celeste Law Firm today at 561-478-2447. We are prepared to help you throughout each step of your case.